TO ensure your property is managed well from day one, should you hire a professional property manager or rely on your own capability to do it? Cost is often a factor when it comes to property management and the lack of funds usually pushes the management corporation (MC) of a strata building to do it on their own. But the wise thing to do is for owners to weigh the pros and cons between the two options before deciding. The main advantage of taking property management into your own hands is that you save on professional fees for property managers, paying only for the cost of hiring staff to do related maintenance works, ac-cording to Malaysian Institute of Professional Property Managers (MIPPM) president Sarkunan Subramaniam. “However, it is very time-consuming because property management is an onerous, full time, round-the-clock task. Owners will need to be prepared to commit a tremendous amount of time for the planning and execution of proper property management,” he tells EdgeProp.my. On top of that, self-managing a strata property will require the owners to be well-versed with the Strata Management Act 2013 (SMA 2013). They should also possess general management skills, such as account-ing or book keeping, technical knowledge, administration and people management, says Sarkunan, who was a judge for EdgeProp Malaysia’s Best Managed Property Awards 2018. “They also have to understand the property and the issues that arise in order to prepare a plan to be exe-cuted. For example, if it is an old condominium, plans need to be put in place for some refurbishment works or upgrades of certain maintenance systems in accordance to the funds available. “If it is a new condominium, attention needs to be placed on management of common area defects, compile the defects list and send it to the developer, as well as appointment of good vendors to ensure the mainte-nance of the condo is done well in order to prolong the building’s life cycle,” he elaborates. Appointing a registered professional property manager, on the other hand, can provide peace of mind for the owners while ensuring the management tasks are being done in adherence to strict timelines and regu-lations although the owners have to pay a higher cost. According to Sarkunan, the property management fees can be divided into two parts, namely the profes-sional fees and the on-site staff cost. The combined cost to appoint a professional property manager could range between 10% and 25% of the total monthly service charge income collected in a property. “There are many property managers in the industry, thus making the task in identifying a suitable property manager challenging. But when the owners do not have the luxury of time to manage the day-to-day or routine matters of managing a strata property, a professional property manager should be hired,” he advises. For those who are looking for a property manager, Sarkunan warns against players that offer cheap fees and who work solo, instead of an organisation. 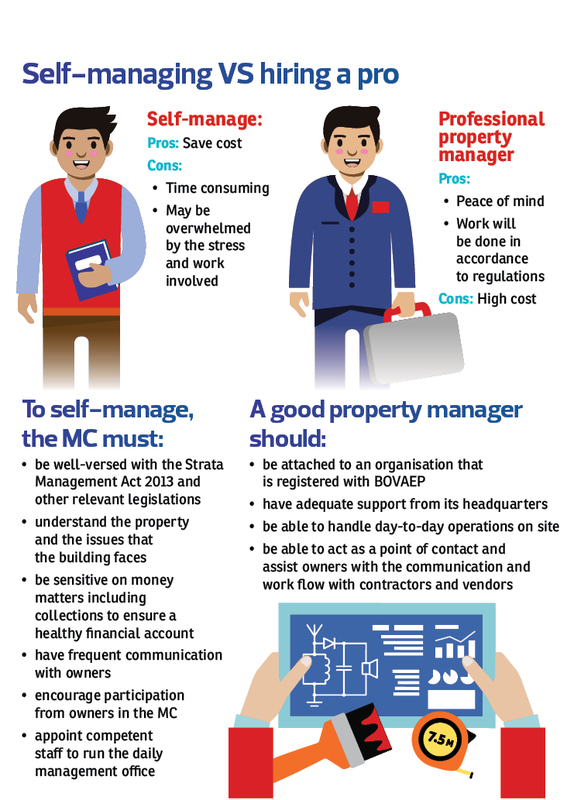 “A good property manager would be an organisation that is able to act as a point of contact for the MC members pertaining to day-to-day operations on site. “Also watch out for those offering cheap fees. Many of them do so because they will charge commissions on certain tasks after being appointed by the MC members,” he says. Hence, he urges property owners to always go for property management firms which are registered with the Board of Valuers, Appraisers, Estate Agents and Property Managers (BOVAEP). If owners still wish to hire those who are not registered with the board, they are advised to collect a bond from the unregistered property manager to protect themselves. Under the Strata Management (Maintenance and Management) Regulations 2015, if a person or agent is not a registered property manager, he or she is not allowed to undertake the maintenance and management of a strata property unless he or she has lodged a bond with the joint management body or MC. The amount of the bond shall be a sum that is equivalent to the remuneration or management fees for 12 months or a sum of RM50,000, whichever is higher. In order to ensure that the property manager is doing his or her job, Sarkunan says that MC members have to carry out meetings at least once in two months in accordance to the SMA 2013. “MC members can obtain up-to-date knowledge of what is happening in their properties during these meet-ings while taking the opportunity to understand the works carried out by the property manager. In addition, monthly reports and financial reports can be requested by MC members so that they know the critical is-sues that occur within the month,” he explains. He points out that there has to be a close working relationships between MC members and the property manager. MC members need to participate and support the actions and operations of the property manager and be involved in decision making in order to ensure that the property manager succeeds in managing the strata property. He points out that there is a misconception that a property manager provides expertise to all matters per-taining to the property. The fact is, property managers execute their functions and roles in accordance to the Property Management Standards. Specific matters such as mechanical, electrical, structural, taxation, legal advice, leasing and rental, and even paint jobs are beyond their purview and clients need to understand that experts need to be separately appointed to handle issues that arise accordingly. However, a good property manager would be able to assist the MC with the liaison, communication and work flow with third party contractors and vendors to address the issues, says Sarkunan. This story first appeared in EdgeProp.my pullout on June 1, 2018. Download EdgeProp.my pullout here for free.